Sanjay Dutt’s biopic Sanju, featuring Ranbir Singh is trending on YouTube again, but this time it’s for the first song of the movie. The song titled as Main Badhiya Tu Bhi Badhiya is sung by Sunidhi Chauhan and Sonu Nigam. The song gives us the hint that this would be the time when Sanjay Dutt is making his way to debut in Bollywood. 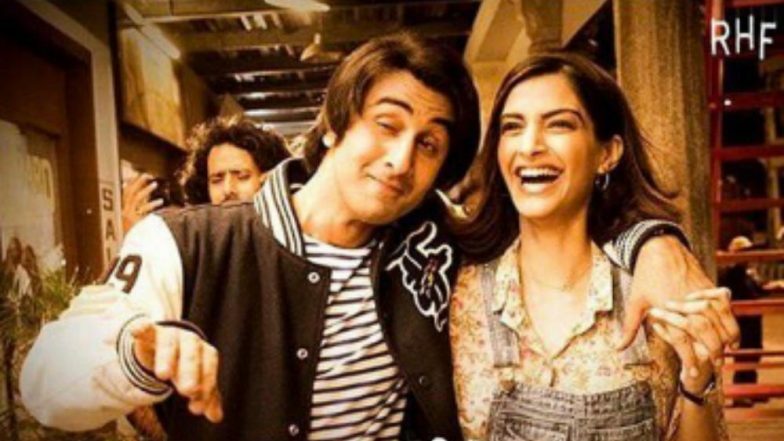 In the song, Ranbir(as Sanjay Dutt) says that his father doubts he can’t lip-sync and he will prove that his father is wrong by lip-syncing convincingly to a women’s voice. This song also features, newly married Sonam Kapoor, she is perfectly dressed in retro style costumes and her dance moves take you to the golden 80’s. The film also features, Anushka Sharma, Dia Mirza, Vicky Kaushal, Manisha Koirala, Jim Sarbh and Boman Irani. Main Badhiya Tu Bhi Badhiya song is written by Puneet Sharma. The movie is directed by Raj Kumar Hirani and produced by Fox Star Studios.